I love your cards... I really like the white space left at the top. Makes your cards unique. These are all so sweet and tasteful. I like your style! Swoon over your CAS cards! I HAD to see all of the inspiration with these amazing NEW products!! So great to have taken part as a guest with you on this Release! Your CAS cards are simply gorgeous...so soft...thanks for sharing!! Very pretty. Your pops of color are so nice with the contrast of the white space. Love your beautiful cards! Awesome new release! Your cards are CAS perfection, Laurie! Love them all. perfect CAS cards as well. Love them! Very nice cards! The hello card is my favorite! Your simple, clean cards are stunning! Perfect examples of wonderful clean and simple designs. So well executed and so eye catching, but yet simple and delicate. Beautiful CAS creaations! Especially love your HELLO card design. Definitely great examples of "less is best". I love the striking simplicity of your cards. Your little vase looks so artsy! Your cards are beautiful and elegant ! I love the effect on the second card with the stamping on the dimensional piece and on the bottom, very pretty. The Hello card is my favorite. I have been making cards using the Altenew alphabet dies. Love them! I love your cards. You have no fear of white and that makes them beautiful. Your cards are just precious! Your HELLO card is my favorite! 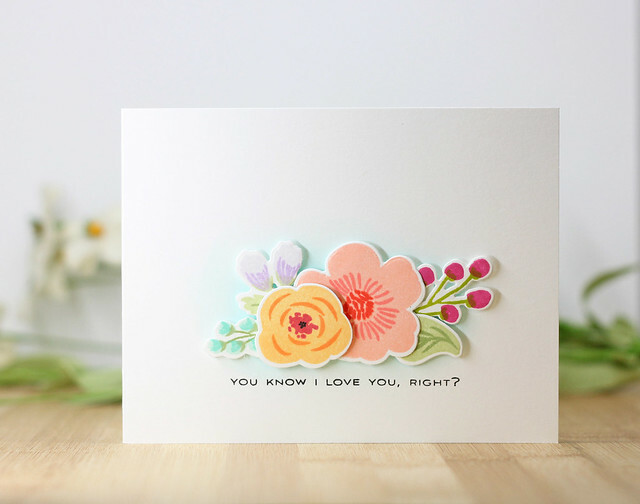 I love the soft romantic florals at the bottom of that card. 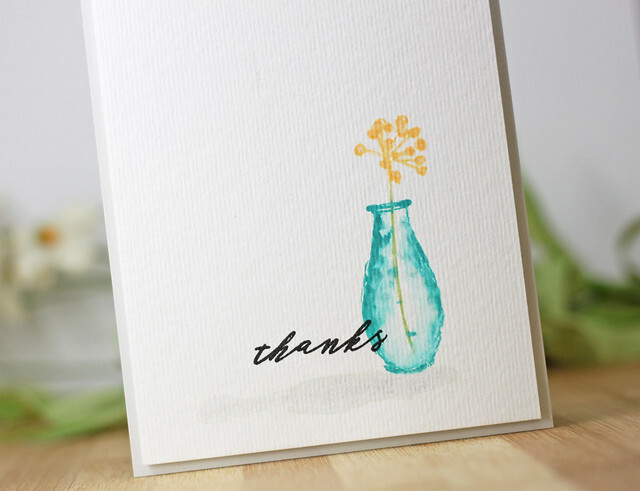 Your Thanks card is nice too with the subtle shadow of the vase and flower on the side. Love your details. Thank you for sharing your creativity!!! Lovely floral cards! I love the way you raised the center rectangle. Great idea!! Beautiful cards. Love your use of space and color schemes.Simplicity!! Your cards are clean simple and most of all beautiful. Such beautiful cards! So lovely! Your cards are stunning! CAS and just so pretty! I love these simple, beautiful cards. I love your cards! I cannot believe how simple they seem to be - and they are SO beautiful! Laurie, your cards are amazing! Just beautiful! Laurie these are fantastic, classic Willison...CAS perfection! Love these so much! clean and simple perfection... each and every one! Your clean and simple beautifully done !! Love the simple and sweet designs!SO clean and simple. Beautiful cards. 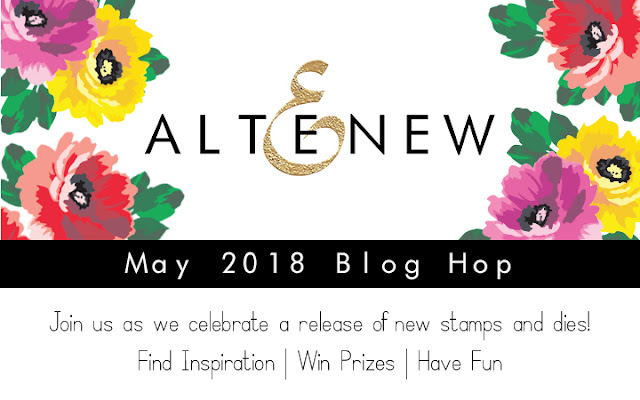 I’m a huge fan of flowers so I’ll have to take a look at these new stamp sets! Lovely cards Laurie. The bride to be floral images are so pretty! Love the soft colors. The silhouette images are amazing too... and oh, that vase... great texture on the card stock. Lovely job on these CAS cards.. Love the ideas and look.. totally have to keep these in mind! Absolutely gorgeous cards, Laurie! I really LOVE how you stamped the vase on the last one...so creative and beautiful! Love your cards...the colors and the CAS style! I am in love with all three of these beautiful CAS cards! Hi Laurie, Love your clean and simple cards, nice and refreshing to look at, TFS, Cheers Anna. Your cards are very pretty. Thanks for sharing. Stunning CAS cards! Wonderfully composed and gorgeous color combinations. Beautiful, simple, fresh. They're lovely! There’s a clean look to all of your card samples. Wonderful CAS designs!! Thanks for sharing. You make clean and simple look so easy! I know it's so much harder than it appears. These are fabulous! I love simple cards the best and these are gorgeous! Beautiful cards and I love the small case with the thank you script. So pretty! Great job! Love all of your CAS cards - they are beautiful! Thank you for the inspiration! I love the simplistic beauty of your cards. And I really love the Fine Alphabet die set! Such pretty cards. Love the simplicity of them. LOVE those sweet lavender sprigs! Beautiful cards! I love the simplicity of your designs. 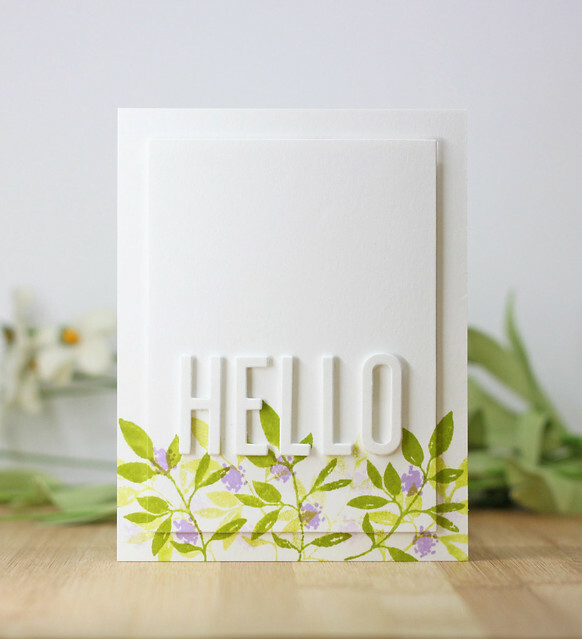 The delicate florals on your second card are so beautifully balanced with the white HELLO sentiment. Loving all those ideas, simple and elegant! Really like your CAS style. Leaving some white space really highlights the stamps. Beautiful cards. Laurie, I love your perky, clean and simple style! They speak volumes :) Thanks for sharing! These cards are so beautiful; love the pretty colors and the simple, clean designs... so peaceful and pleasing. I love simple cards and yours are stunning. Especially the first one. I adore the simplicity of your cards! WOW Laurie, these are gorgeous, CAS cards. Very nice. I really like the watercolor effect on the little vase. beautifully done. I LOVE your CAS cards!! My favorites of this blog hop!! Three beautiful CAS cards with lots of white space and each one very different from the next. Love these, Laurie! So pretty, love the simple elegance. Laurie, you really have some fabulous CAS designs with these sets! Lovely! All of your cards at beautiful, I cannot choose a favorite! I love your CAS style. You always know the right elements to add to the main images to make them pop, like the light blue haze or the small shadow. It's the little things that make your cards great. Thanks for sharing with us! 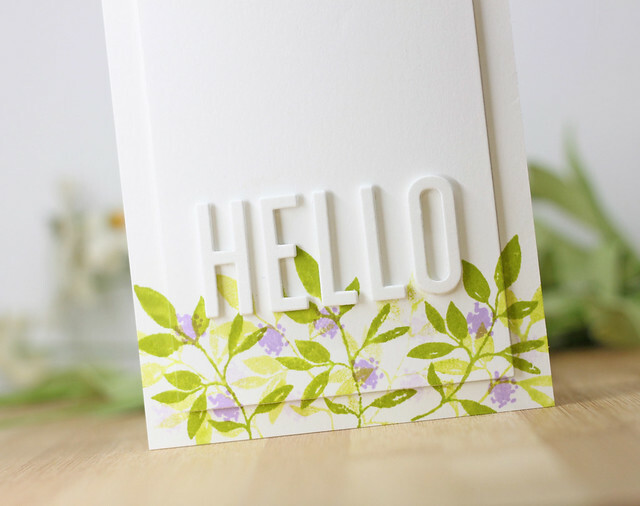 I love the hello card, the colors green yellow and purple are perfect! Beautiful, clean cards. Love the soft colors. I love your CAS cards - so much lovely white space - makes the rest of the card elements pop. Love your CAS cards! Sometimes simple is the best!! What a beautiful watercolor vase! I love the way you layered the stamped images on the Hello card. Three lovely cards! I really like the clean and simple designs. Beautiful, simple cards! :) Love them! Gorgeous cards. Love your simple florals. I love your cards! Simple yet very elegant. The white space just makes it all pop. So beautiful I love the clean elegant look! Love your CAS cards for they are stunning! Simple but absolutely lovely. Thank you for sharing them! I like your sweet card designs. 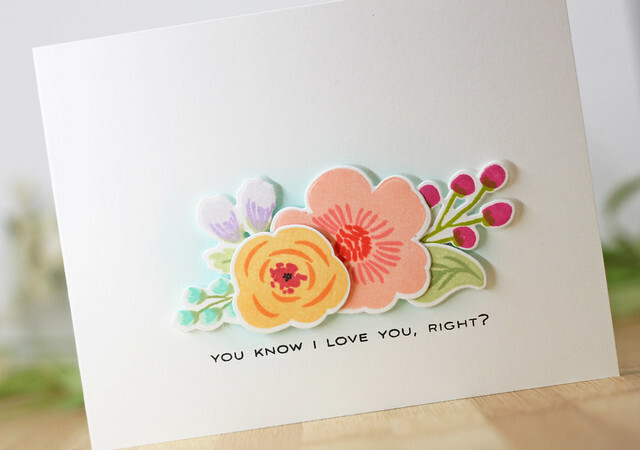 Love the simplicity to your cards, the color combos and use of die cuts. Beautiful and elegant! Love how you make simple look so fabulous ! 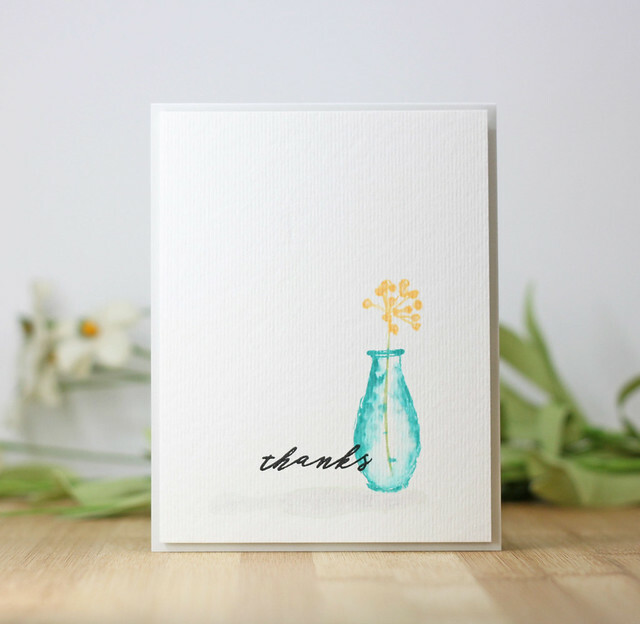 Love these cards - the watercoloring is especially wonderful! I love your card with the blue vase. So simple and elegant. Laurie, your cards are such a great example of clean and simple cards! I love all your cards, but my favorite is the one using the Bride to Be set. It is just so pretty. Your Hello card is so creative....I can't wait to try that technique! !